So why stop with Babe? 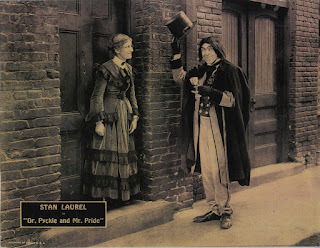 Here are some lobby cards of films starring the comedian formerly known as Stan Jefferson. By the time this film was released Stan had left G.M. Anderson and was over at the Hal Roach Studios filming UNDER TWO JAGS. I really like the Amalgamated comedies and it was this series, not the soon to follow series at Roach, that really established Stan as a viable star film comedian. Stan's next to last film for Hal Roach during his second tenure at the studio. 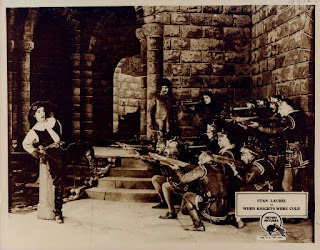 A "travesty" of RUPERT OF HENTZAU (the sequel story to THE PRISONER OF ZENDA) with Stan playing a dual role. Stan's next to last film for Joe Rock is probably his best solo film ever. Watching the films he made between 1922 and 1925 for G.M. Anderson, Hal Roach and Joe Rock show that Stan would have been a star with or without Oliver Hardy (but yes, not likely to the great degree the Boys obtained together). But by the time this film was released Stan had already directed three comedies for Hal Roach beginning his intended career as solely a behind-the-camera talent. You have really provided some valuable information and i really liked it..!